I love Catbus he is the cutest. Haven't yet been to the ghibli museum (where they have a semi-life-size catbus) but I'm going to be in Tokyo for a while so hope will be able to get tickets from lawson's! The sort of pet I would definitely like! So cute and adorable! Your link is no longer a viewable source for the movie due to its availability being terminated because of copyright infringement, so allow me to update your comment: Guess what I found! Mei and the Kittenbus! (Recorded by Camera though, with two heads partially blocking the screen, but it's still good!) WARNING: This video was available at the posting of this comment [10/14/2013] and could possibly be removed thereafter. CATBUS!!!! Wow, he's so adorable! GRRRReat Catbus! Miyazaki inspire you too? why has no one told me about this ghibli museum yet?! So cute! I like your take on it. pweee. so cute! I love ghibli studio productions. it's only shown in the museum, mei finds a catbus kitten in her house and feeds it caramels, it's really cute. Oh God, that's too adorable for words! Awe!! Love all it's poses and expressions. Great idea... seeing the catbus as a kitten. SOOO many memories with this! My absolute favorite part of the movie. haaaaay, el gatito bus!! soo cuuute!! Wow, I don't usually see art of the catbus. O___O Nice work! I love it! If i didn't already want a pet catbus this image has cemented the concept to me. Utterly adorable and filled with detail that I will enjoy for hours! B'awww. 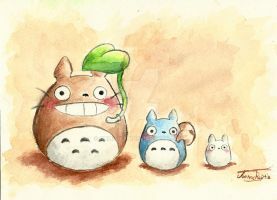 Now I'm really regretting having not watched the Japanese version of Totoro when it was on TV the other week. D: I was afraid to watch it because I'm so used to the 1984 English dubbed version. lol. Ah I don't think different voices will change the magic of Totoro The song is kind of creepy though when I listen to it now!! LOL. But it's so cute hearing all the little kids at my elementary school singing it. Love the poses, and the new stylistic twist you've put on him!